Brass hand stampings clamped to dry after getting coated in black glitter. The first Blog Hop of the Build a Line Challenge class (BALC) has finally arrived! Part of the application to the class was to choose a theme to focus our five piece minimum jewelry lines. My classmates and I have kept our themes secret until this point. Various photos related to my theme. So many possibilities! I will have to narrow it down some for the sake of having a cohesive line at the end of class. Here is an earring that I am working on for my line. The necklace on the top left was the first necklace I made. It has been taken apart and updated many times. 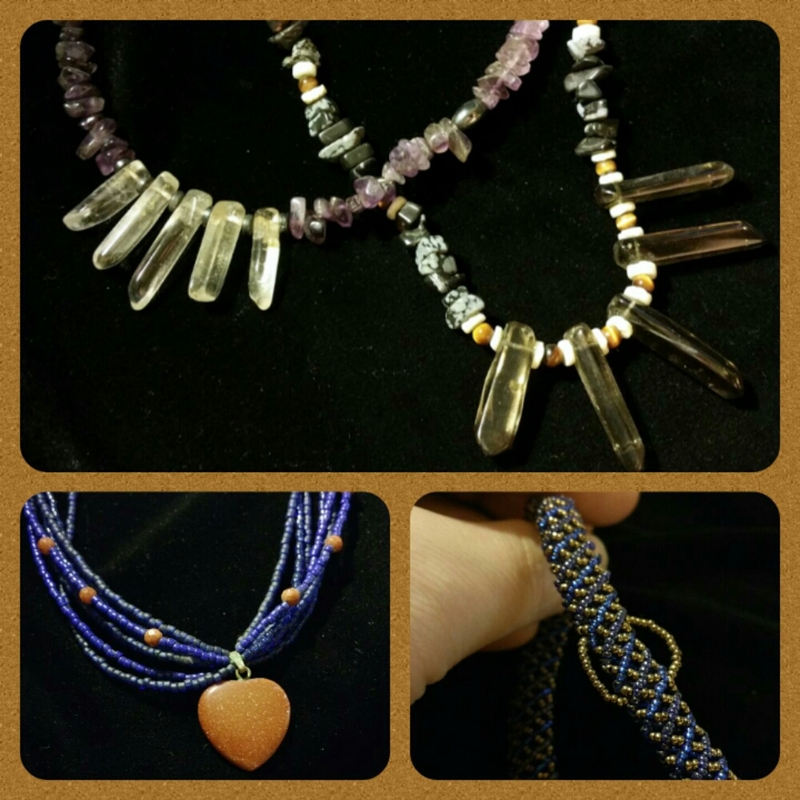 The amethyst beads came from my first beading kit. (Bottom left) Goldstone and seed bead multi strand necklace. I started working with multiple strands. I have always loved coppers and blues together. (Bottom right) Eventually I desired to create more intricate things. I purchased a book on bead stitching and this was one of my first projects. When I was a child I was fascinated by geology, specifically petrology which is the study of rocks. This early love of rocks and minerals is evident in most my jewelry. I continue to incorporate semi precious stones in many of my designs but have also learned to enjoy other media as well. Expect to see more of these awesome little genuine Swarovski chandelier crystals. 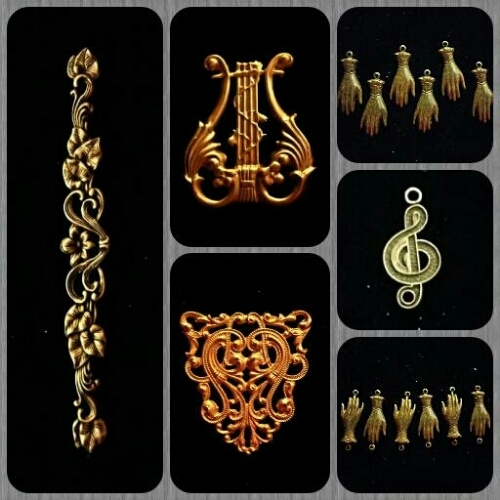 Brass stampings from B'sue Boutiques. This is my first time working with brass stampings in my jewelry. 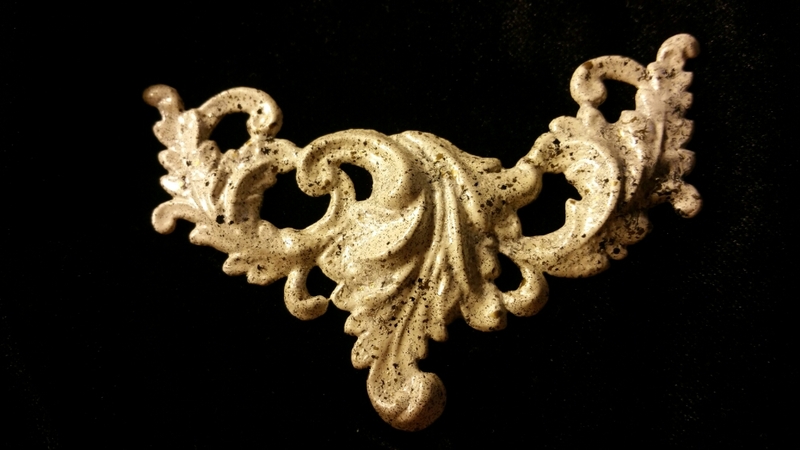 This brass stamping is also from B'sue Boutiques. 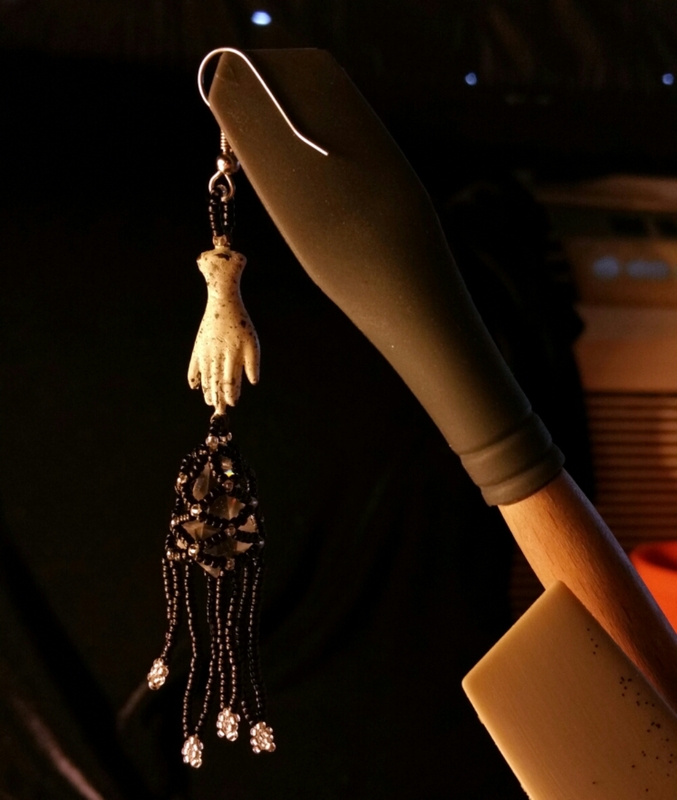 It had been treated with antique ivory relique powder, as has the hand in the earring photo earlier. Ice resin is one of my favorite things. 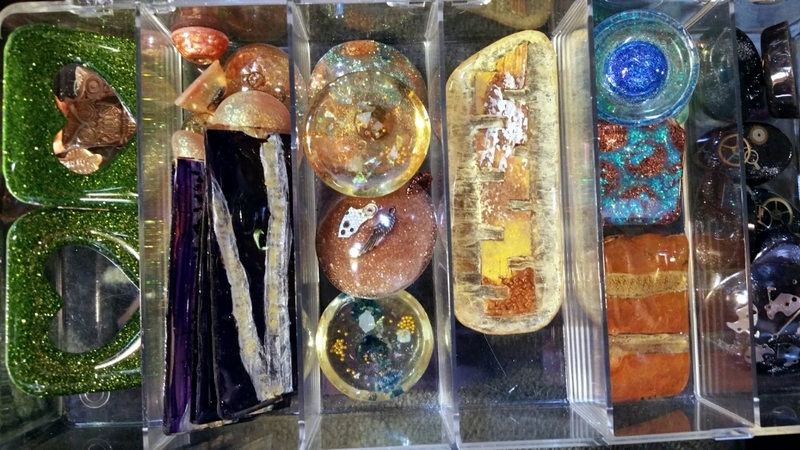 Here are some of my many resin works in progress. I'm hoping to create a bridge between all my favorite things and find some new in this class. If they cannot all fit into my line then I am confident this class will give me the tools to create multiple focused lines going forward. Brass stampings, ICE Resin, iced enamel relique powder, and many other awesome jewelry making supplies available at B’Sue Boutiques also check out her informative video tutorials. Please join me in hopping over to each of my classmates blogs. I cannot wait to find out what themes they all have chosen. Previous postTesting links for the upcoming blog hop. Next postBUILD A LINE CHALLENGE BLOG HOP #2: Where have you been? Where are you now? Where do you want to go from here? This will be an exciting line . Look at all the textures you may be using. Looking forward to seeing more i=of this line. I am fascinated with ice resin, and have a love for natural stones as well. Your line will be wonderful! I am a IATSE member as well. 🙂 I love my job and I feel very lucky to be involved with it. What a fun idea for a theme! It’s the glitz and gritty side of theater. I may focus more on concerts and corporate events because I work them more often, but I am occasionally lucky enough to get into a theater. They are absolutely breathtaking. Even behind the scenes I find everything very visually stimulating. Intriguing! You have whet my curiosity…can’t wait to see your theme unfold! I can’t wait to see what you do with all those delicious pearls. Thank you so much for the kind words. I am looking forward to your intriguing jeweled in white line as well. That is daring to go so far out of your comfort zone, you are an inspiration. I’m excited to see more!! Hugs. That hand has me intrigued. Crystals are great. Looking forward to seeing what comes of this. What an interesting job you have Jeanette! Great idea for your line! I look forward to seeing the end result. Your beaded jewelry is nicely done. Thank you for visiting. I’m glad you like it. Well done, Jeanette, and I am confident that you will finish our class with the beginnings of a great new line…..and even more great new ideas. I am so delighted that you joined us. Thank you for branching out to work with brass stampings. They just make your crayon box grow larger….more tricks, more ideas, more methods….delightful discoveries and sometimes….some happy accidents! ENJOY the class and the new pathways! I love your crayon box metaphor. It really is perfect likening to artistic skills. No one can ever have too many crayons. Thank you for accepting my application. I am really enjoying this experience and am learning more so far than I had imagined. Thank you for offering this class. Love your idea and inspiration! Iced enamels are so much fun and love how you used them. Looking forward to seeing more! Enjoy your journey with this wonderful class. Iced enamels are new to me. I mean I had heard of them but had not played with them until now. I’m going to hold off getting more colors though as I could see myself making a new huge pile of components and having no jewelry to show for it lol. Thank you for stopping by and leaving me a note. Have a great day. You have an interesting job, I can’t wait to see how you translate theatre through jewelry! I work mostly in Concerts and corporate events but I am lucky enough to get into a theater every now and then. Thank you for visiting my blog, see you in class. Oh those textures are intriguing. looks like a great start on your line! I think you are going to have a unique and interesting line Jeanette. Looking forward to it. Thank you. I am looking forward to seeing what you come up with as well. I especially like the heart stampings I saw in your components photo. Wow Jeanette. That’s a wonderfully original theme you’ve come up with. I love it! I am looking forward to the cool things you’ll be making. Enjoyed your blog. 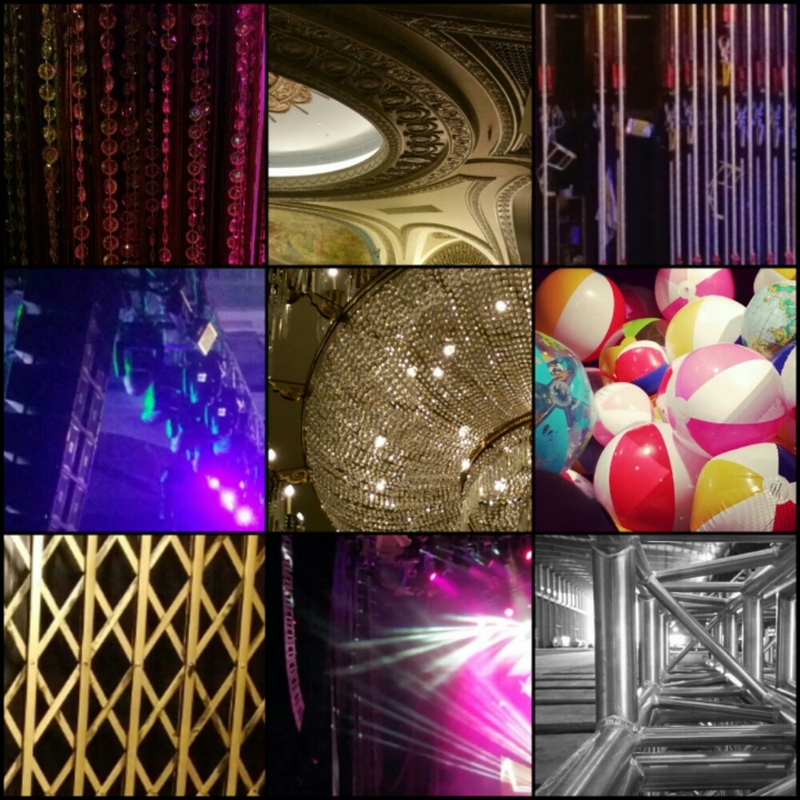 I love the peek into your design and cant wait till the curtain opens. Thank you. I enjoyed yours as well. Looking forward to seeing what you do with the bonnets. Neat idea for your line. Looking forward to the reveal! Brass stampings and everything that goes with them are addicting! I’m new to stampings, I think they are really cool but it’s been a challenge to incorporate them in my designs. I really enjoy it though and am looking forward to seeing what else I can do. Thank you, I’m a big fan of the black glitter too. I can see why you picked hands for your line. They are so versatile. I am a geologist and you are the first person that I have met that knows about petrology. It is my favorite discipline in Geology. It is fascinating.I’m looking forward to seeing your line. I was always wanting more books about rocks when I was a child, I collected rocks and loved to read about them. It is something I definitely want to delve back into now as an adult. Rocks and minerals and their creation are fascinating. I started picking up rocks when I was a girl and we would travel around the country on vacations. I still have many of them around my water garden in the back yard. I studied petroleum geology in school but I wish I would have studied more about volocanoes. Enjoy creating! I bet you have an amazing time at your job. I love being on stage either as a performer or working behind the scenes, it is thrilling! I was heavily involved in the theater and dance throughout high school and later in college. I love the idea that you will tie your line into this field of work – that is going to be amazing! I’m no geologist, but I am a rock hound. I have always been fascinated by the study of rocks (though I didn’t know it was called Petrology) I have collected a great deal of rocks in my travels. Nearly everywhere I go I collect new rocks and fill my house with jars of them. I love the idea that you will use this interest in your jewelry making. I have experimented only a little bit with Ice Resin and a bit more with Iced Enamels . The Iced Enamels were definitely a blast for me to use ( I have all the colors.) I look forward to seeing how you incorporate these in your line – the Ivory Relique looks fabulous! Thank you Diana, I am looking forward to your take on MOD inspiration. What a great job to have! Your theme is intriguing and I am anxious to see what you do with it, Jeanette! Nice blog post! I am looking forward to seeing your fall leaves line. this has me totally intrigued! Can’t wait to see it done! Stagehand! I bet you have an interesting life, and it will surely show up in your jewelry. Thank you. I can’t wait to see your vintage modern designs. Your clay and beadwork is stunning. 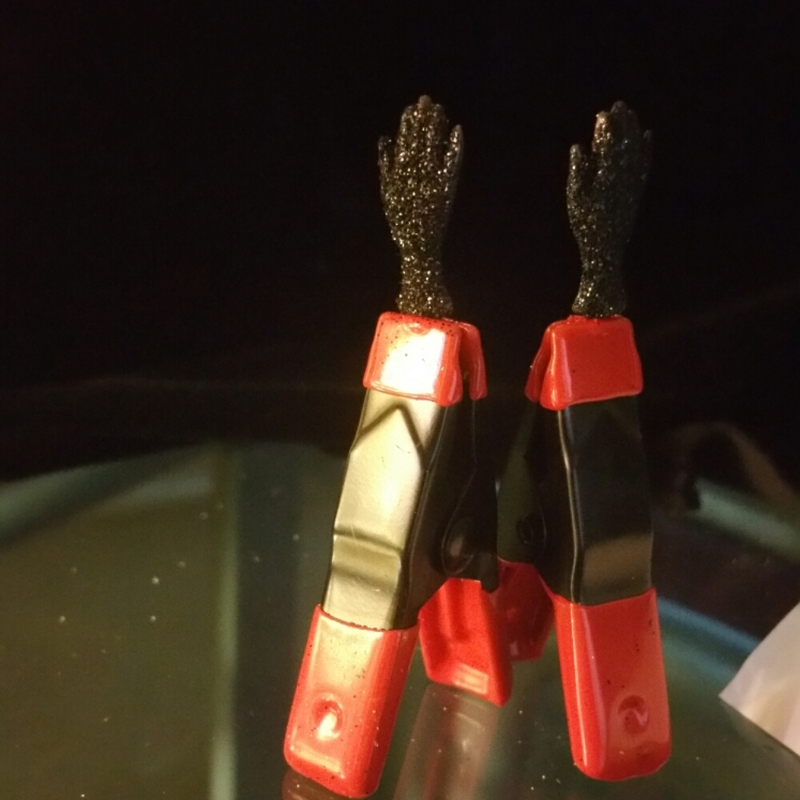 So far they are my favorite component too. I may very well need more hand stampings before the end of class. Hi Jeanette, I’m happy to be sharing this class with you. I’m very curious as to what direction you’ll take with your theme. There are so many possibilities it would be hard for me to decide. I am finding the many possibilities a little bit daunting. I want to explore them all! If I did though my line wouldn’t look cohesive so for now I am going to have to pick one and maybe try others later. Such a great theme and you can do so many things with it! Can’t wait to see what you do. Thank you. I am excited to see what your around the world line looks like as well. I love Ice Resin too! Very excited to see what you do with it! 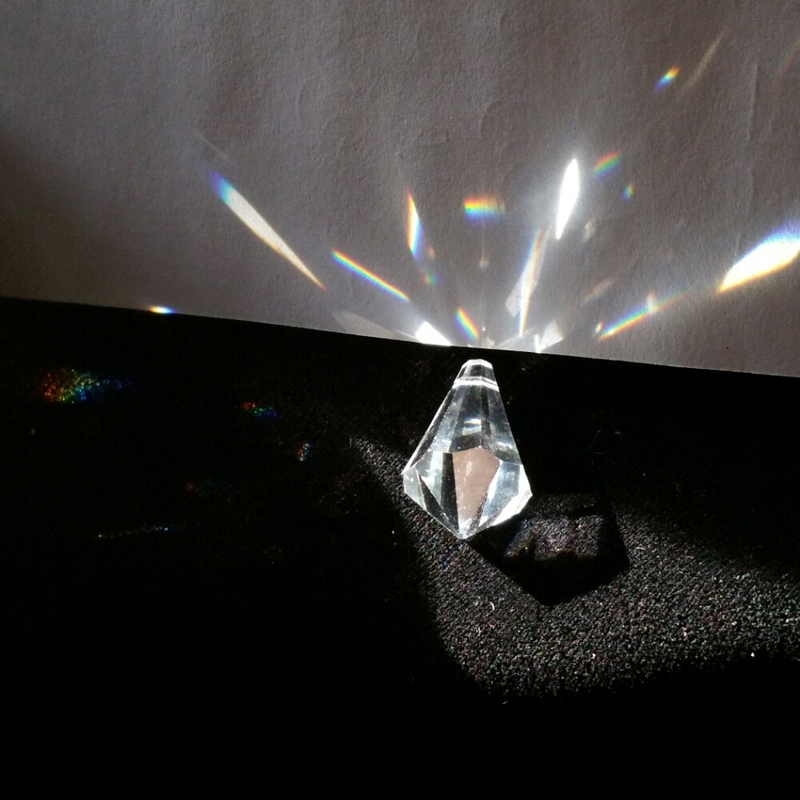 Mysterious. . .digging the crystal! Cannot wait! Thank you, I’m looking forward to your caging designs. I plan to take a leap to the wild side of Ice Resin also. This should be quite exciting!! Connecting the geology, resin and brass should be a fun challenge! Take the leap! You will not regret it. I am looking forward to seeing your line too. What a cool blog and interesting concept for your line I can’t wait to see it evolve! XOXO! Enjoyed your blog Jeanette and you have a very creative job. You must enjoy it. Very excited to see where this takes you. Lovely textures and fun to see how you will have such varied materials combined at the end of class. You are already quite accomplished in so many different media-this is sure to be a hit for you! This sounds like a very interesting line. Loving the pieces treated with that frosty white! Beautiful finish! Another unique theme you got there. I’m pretty sure this would result into a wonderful line of jewelry.